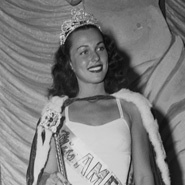 In 1945 Bess Myerson became the first, and to date, only, Jewish Miss America. Myerson faced antisemitism when she competed for the crown in 1945 and refused to adopt a name that sounded "less Jewish." After winning the title, three of the five sponsors of the pageant declined to allow Myerson to be their spokesperson. Upon completing her terms as Miss America, Myerson campaigned for civil rights on behalf of the Anti-Defamation League and the NAACP. She appeared as a panelist on the game show I've Got a Secret from 1958 to 1967 and later found success as a TV personality, actress, and star of television commercials. She became New York City's first commissioner of consumer affairs and later ran for Congress.